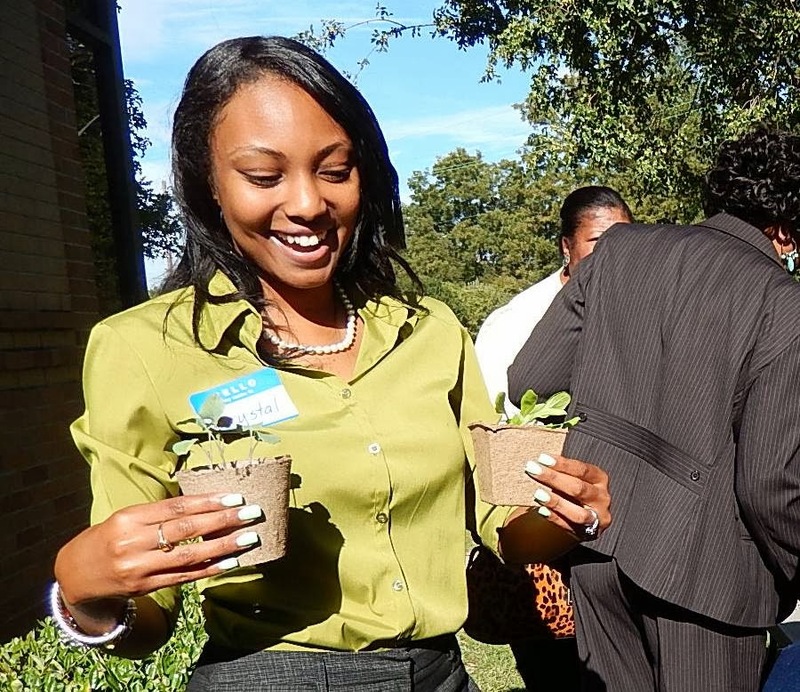 Baton Rouge, La - The Southern University Ag Center worked diligently to support student members of the Minorities in Agriculture, Natural Resources, and Related Sciences (MANRRS), in their effort to make a difference in the community this Thanksgiving season. 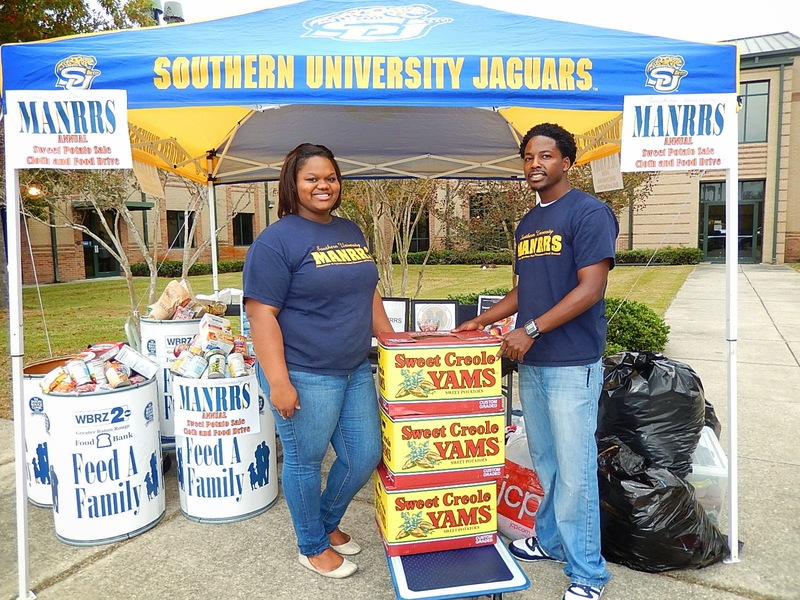 The Southern University MANRRS chapter held a sweet potato sale, food and clothing drive at the SU Ag Center on November 21. The student organization was very active before and during the food and clothing drive. Following the event, the students will give the food and clothing collected to WBRZ's Feed A Family for distribution. “The support from the community was huge. I’m excited that we can help somebody during this Thanksgiving season,” said Robert Chambers, doctoral student in urban forestry, and Region I Graduate Student Vice-President for MANRRS. “Since this is our first time ever to hold a food and clothing drive, it is amazing how much food and clothing items have been contributed. In the past we only did the sweet potato sale, and now we’re expanding to feed and clothe the needy in our community,” said Tanyatta Mayo, senior in dietetics program. 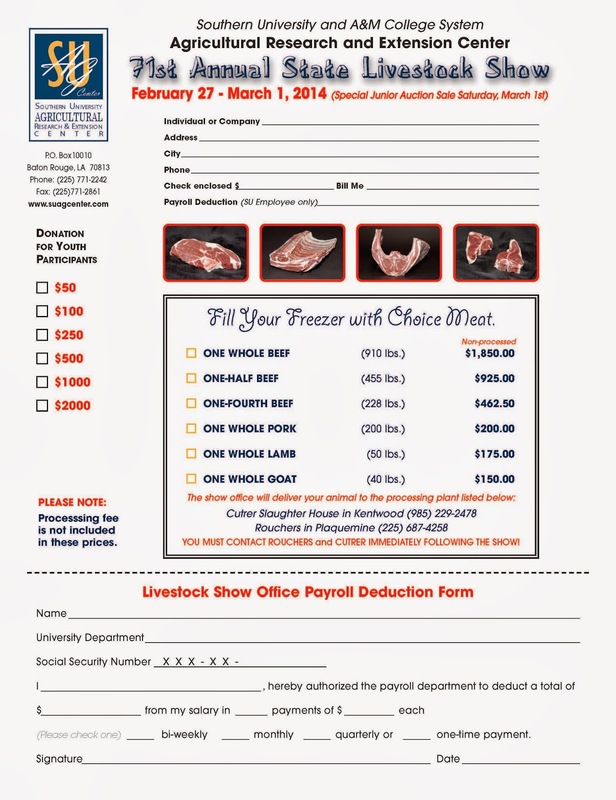 To ask questions, place an order, or drop off items, please contact Zanetta Augustine at 225-771-2591. 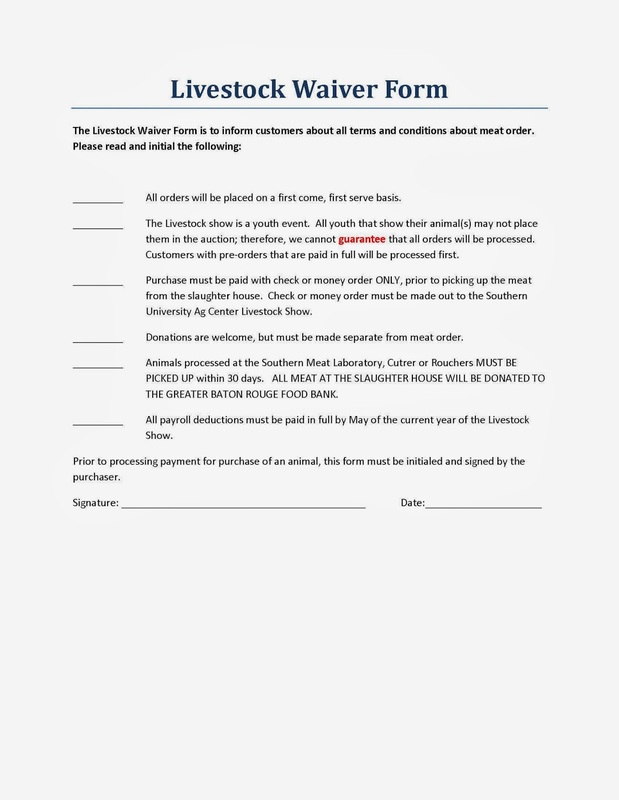 Baton Rouge, La - The Southern University Ag Center has received funding to replicate the 4-H LIFE Continuation-Only project, engaging 50 youth, the incarcerated parent, and the caregiver at both the St. Landry and East Baton Rouge Parish Prisons. 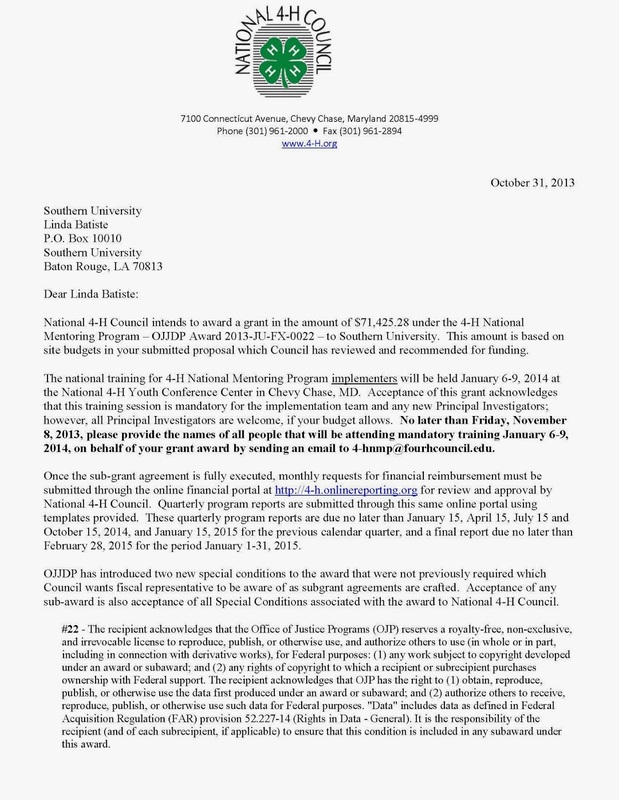 The National 4-H Council has issued a letter of intent to award a grant in the amount of $71,425.28 under the 4-H National Mentoring Program – OJJDP Award 2013-JU-FX-0022 – to Southern University. The Office of Juvenile Justice and Delinquency Prevention (OJJDP) funds the 4-H Living Interactive Family Education (4-HLIFE) through the National 4-H Council. Subsequently, the Council provides a request for application to qualified candidates to apply for the funds. There is stiff completion for the grants since applicants include Tech Wizards, 4-H Youth and Families with Promise – 4H YFP, and 4H LIFE. The SU Ag Center has been a sub-awardee to 4-H Council for four years. The program is set up to replicate Missouri’s program that has been operating successfully over the past 14 years. The SU Ag Center has been conducting the 4-H LIFE program in East Baton Rouge and St. Landry Parishes since 2010. Over the past three years, Louisiana’s 4-H LIFE Project has reached more than 800 individuals, including youth (ages 8-17), inmates, and caregivers. Beginning February 2014, the age range for qualifying youth participation will be 5-17 years old. “The impact is definitely positive on inmates and family members,” said Tiffany Franklin, Principal Investigator. The purpose of the 4-H LIFE program is to enhance familial relationships between incarcerated parents, their children, and caregivers. The program targets youth ages 5 to 17 and seeks to reinforce critical elements that inmates, children, and caregivers encounter during the parent’s incarceration. The program intends to continue to use best practices to increase familial relationships during visits, increase participation in family activities, and inspire parents to regain control of the relationship as an authoritative person in their child’s life even though they are incarcerated. In the coming year, the SU Ag Center will replicate the 4-H LIFE Continuation-Only project, engaging 50 youth, the incarcerated parent, and the caregiver at both the St. Landry and East Baton Rouge Parish Prisons. Each site will begin using the Nurturing Parenting Programs by Dr. Stephen J. Bavolek, who is recognized nationally in the fields of child abuse and neglect treatment and prevention, and parenting education. He is also the principal author of the Adult-Adolescent Parenting Inventory, which is designed to assess high risk parenting attitudes. The evidenced-based curriculum’s engaging lessons and activities are ideal and will encourage positive interactions between the children, inmates, and caregivers. The 4-H LIFE team has been trained to implement all parts of the aforementioned curriculum. The program is directed by Tiffany Franklin, Principal Investigator and Milissia John-Baptiste, Program Assistant. The program staff is scheduled to attend the annual mandatory training January 6-9, 2014. Mentoring positions are open to the public. Are you interested in becoming a Mentor for this project? Please contact Tiffany Franklin, or Milissia John-Baptiste at 225-771-2242. Baton Rouge, LA –The Southern University Ag Center held the first workshop in its Wisteria Alliance Women in Ag training series on Saturday, November 16 at the Maurice Edmond Livestock Arena in Baker. Workshop topics included understanding the basics of farm safety presented by Dawn Mellion-Patin, Agricultural Specialist; handling small tools by Victoria McMullen-Dunn, Agricultural Science Educator in East Feliciana Parish; and making garden waste work for you, Mila Berhane, Senior Research Associate. Participants learned how to make a picnic table in their hands-on exercise. 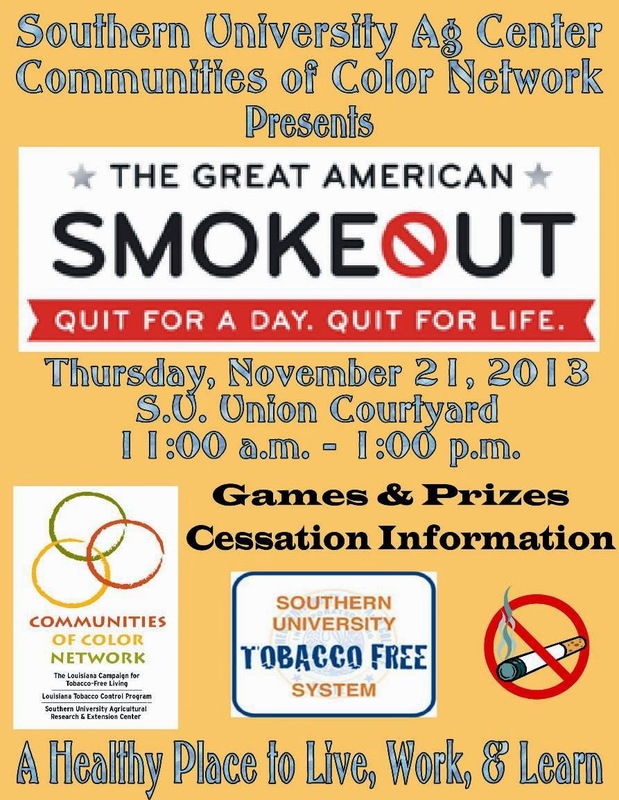 Baton Rouge, LA- the Southern University Ag Center’s Communities of Color Network will host an event to mark the 2013 Great American Smoke Out Day in the Smith-Brown Student Union Courtyard on Thursday, November 21, from 11:00 am-1:00 pm. Every year, the America Cancer Society observes the third Thursday of November as Great American Smoke Out Day to encourage smokers to quit smoking for that day, with the hope that they will stop smoking for a lifetime. Event activities will include games, prizes and dissemination of tobacco cessation information. 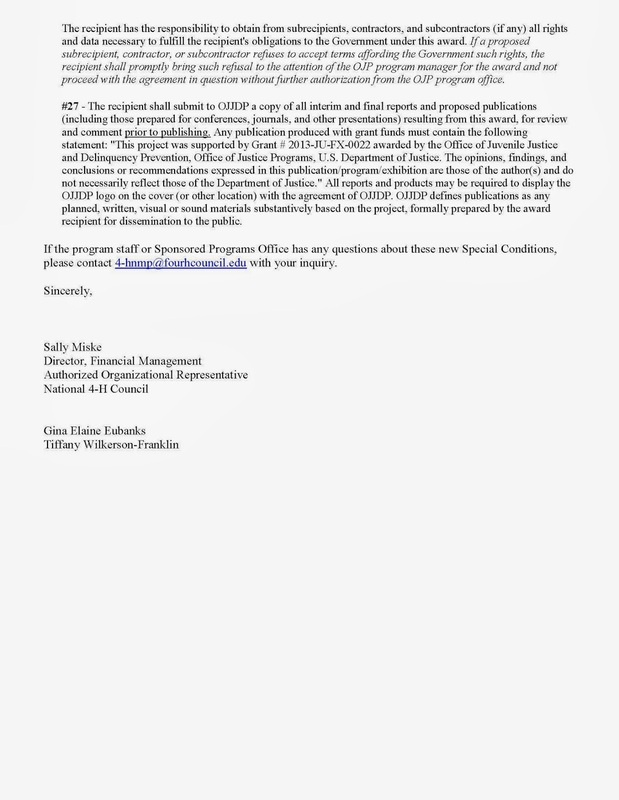 The 100% Tobacco-Free Southern University System Policy provides a healthy place to live, work and learn. Baton Rouge, LA –The Southern University Ag Center will hold the first workshop in its Wisteria Alliance training series on Saturday, November 16 at the Maurice Edmund Livestock Arena in Baker. The workshop is designed to help women on the farm or those interested in gardening to sharpen their skills. The training is open to the public at no cost. Training starts at 8:30 am, and ends at 2:00 pm. Topics in breakout sessions will include handling small tools, small engine maintenance, and making garden waste work for you. For further detail, please contact Zanetta Augustine at 225-771-2591, or via email at Zanetta_Augustine@suagcenter.com . Baton Rouge, La - the Southern University Ag Center is working with a student organization, Minorities in Agriculture, Natural Resources, and Related Sciences (MANRRS), to reach out to surrounding communities this Thanksgiving season. 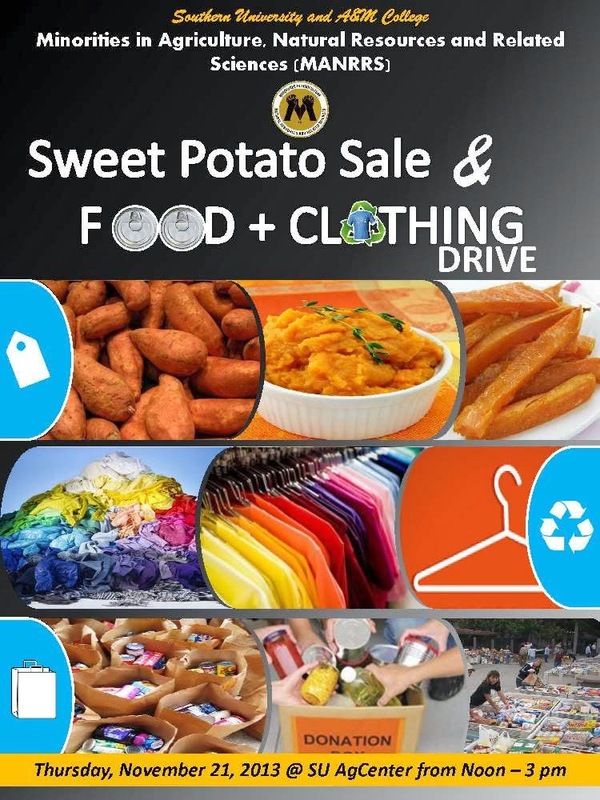 The Southern University MANRRS chapter is sponsoring a Sweet Potato Sale, along with a Food and Clothing Drive. The deadline for the Sweet Potato orders is Nov. 15. The last day to bring items for the Food and Clothing Drive is November 21. Your support is highly anticipated and appreciated. The attached flyer contains full details. Thanks! The event will take place on Thursday, November 21 from noon-3:00 pm at the SU Ag Center-A.O. Williams Hall. 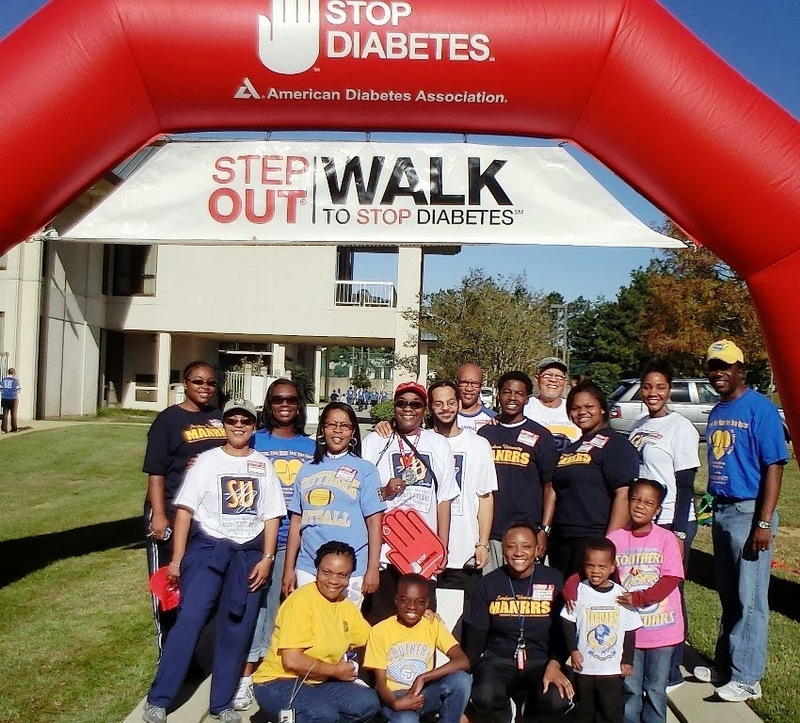 SU Ag Center Team to participate in the annual Step Out to STOP Diabetes Walk!!! Baton Rouge, LA - Team SU Ag Center is set to participate in the 2013 Step Out to STOP Diabetes Walk. By taking part in this event, you'll be stepping out onto the streets to help change this growing epidemic. Here are reasons you should take pride in participating in Step Out: Walk to STOP Diabetes: about one in 10 American adults now has diabetes; Diabetes is the seventh leading cause of death by disease in the U.S.; one out of every three Americans born today will develop diabetes in their lifetime if present trends continue. It's Not a Walk for Heart Disease, Stroke or Kidney Disease. And Yet It Is! Diabetes can, and does, lead to a wide range of other serious health complications. Date: Saturday, November 16, 2013. (SU and LSU play home games). Time: Event Starts at 10 AM (Opening Ceremony & Warm Ups at 9:30 am). Please show your support and add your HAND to the Diabetes Tree of Life in the SU Ag Center Foyer! Thanks in advance for your usual support & I look forward to hearing from you. 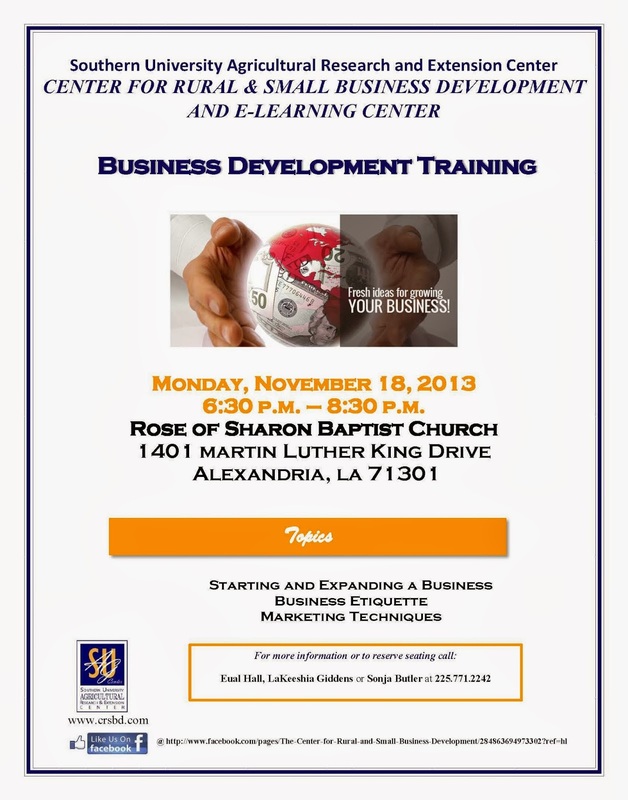 BATON ROUGE, LA — The Center for Rural and Small Business Development in the Southern University Agricultural Research and Extension Center will hold a free ‘Business Development Training’ from 6:30 p.m. to 8:30 p.m. on Monday, November 18 at the Rose of Sharon Baptist Church, 1401 Martin Luther King Drive, in Alexandria, La. The seminar is free and open to all current and potential small business owners. Participants will learn how to start or expand an existing business; receive the forms and applications needed to legally operate a business in the state of Louisiana, information to ensure that an existing business continues to operate efficiently, business etiquette information and marketing techniques to help promote your business. To receive additional information about the Center for Rural and Small Business Development or its E-Learning Center, contact Eual Hall, LaKeeshia Giddens or Sonja Butler at 225.771.2242. 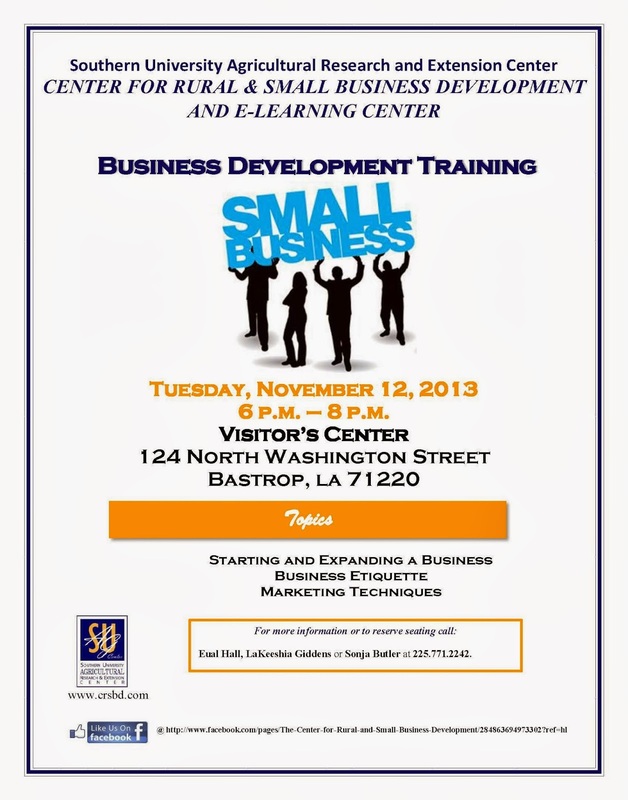 Baton Rouge, La -The Center for Rural and Small Business Development in the Southern University Agricultural Research and Extension Center will hold a free ‘Business Development Training’ from 5 p.m. to 7 p.m. on Thursday, November 14 at the Thomas Jason Lingo Community Center, 10284 Highway 17 South, in Oak Grove, La. The seminar is free and open to all current and potential small business owners. Participants will learn how to start or expand an existing business; receive the forms and applications needed to legally operate a business in the state of Louisiana, information to ensure that an existing business continues to operate efficiently, business etiquette information and marketing techniques to help promote a business. To receive additional information about the training contact Carolyn Robinson at, 318-428-3571 or Eual Hall, LaKeeshia Giddens or Sonja Butler at 225.771.2242. Baton Rouge, La - The Center for Rural and Small Business Development in the Southern University Agricultural Research and Extension Center will hold a free ‘Business Development Training’ from 6 p.m. to 8 p.m. on Tuesday, November 12 at the Visitor’s Center, 124 North Washington Street, in Bastrop, La. To receive additional information about the training or the Center for Rural and Small Business Development, contact Eual Hall, LaKeeshia Giddens or Sonja Butler at 225.771.2242. 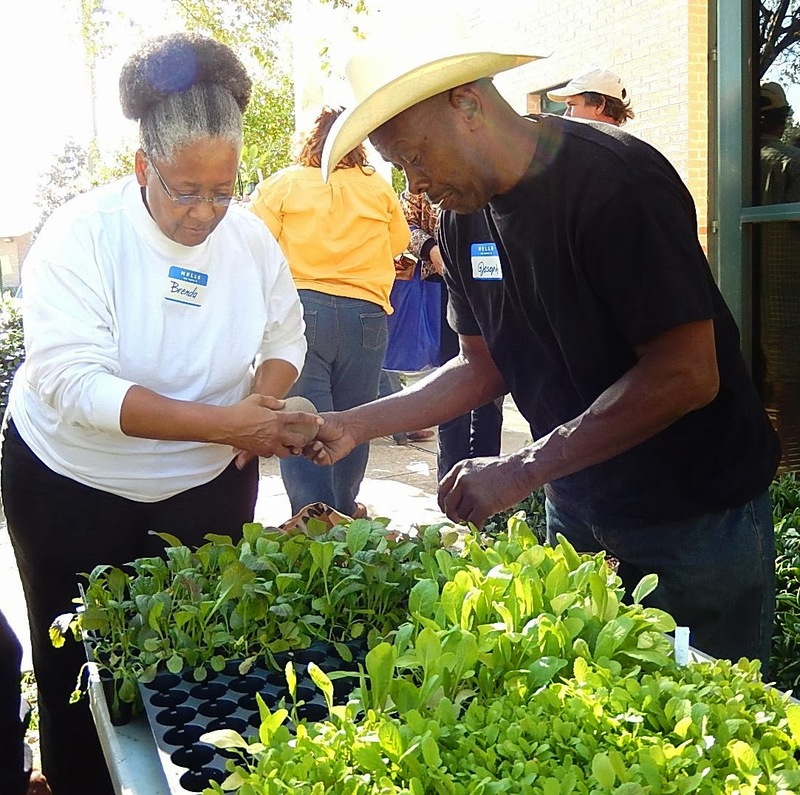 Baton Rouge, LA - The SU Ag Center held a Community Garden Workshop today, November 4, 2013 from 10 am – 3 pm in A. Williams Hall. The workshop featured fall vegetables suitable for Louisiana weather, in the yard or in containers. Topics of discussion and related hands-on activities centered on community, school, and container gardens. The training culminated in potting fall vegetable by participants who then took their seedlings home to grow and nurture for healthy eating. This event, like many others, is geared towards reducing food deserts, encouraging physical activities, and healthy living. Stephanie M. Elwood, Extension Associate for Community Gardens; Mila Berhane, Senior Research Associate; and Tiffany Franklin, Extension Associate organized the event. 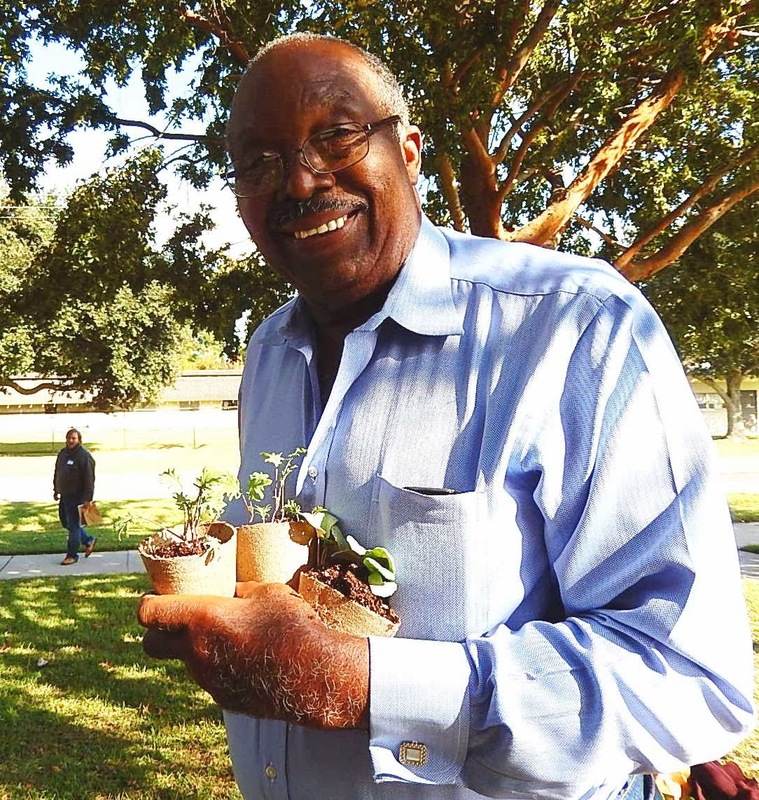 To get help starting a garden at home, school or community, call 225-771-2242. 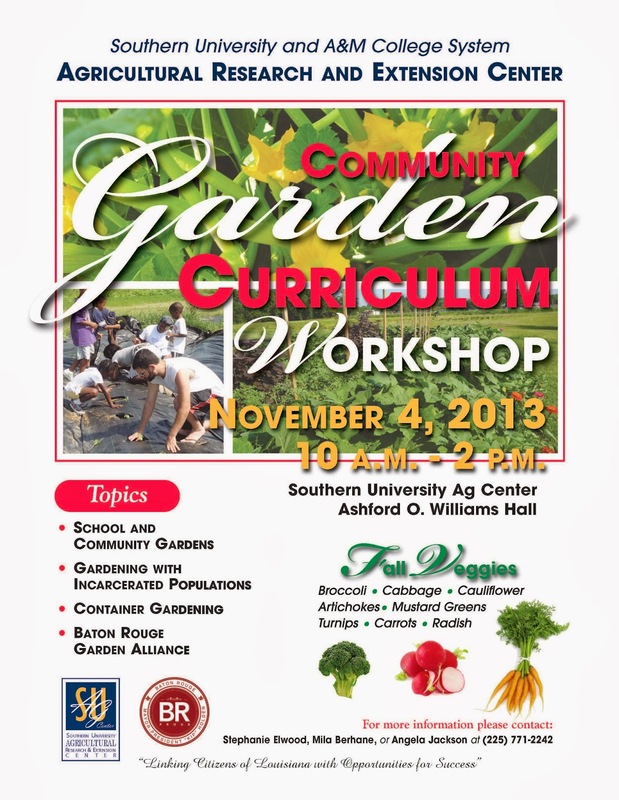 Baton Rouge, LA - The SU Ag Center in Baton Rouge will hold a Community Garden Workshop in room 191, A. O. Williams Hall on Monday November 4, 2013 from 10 am – 3 pm. This Fall Garden Workshop will conduct several garden related hands-on activities and discuss topics related to community and school gardens. 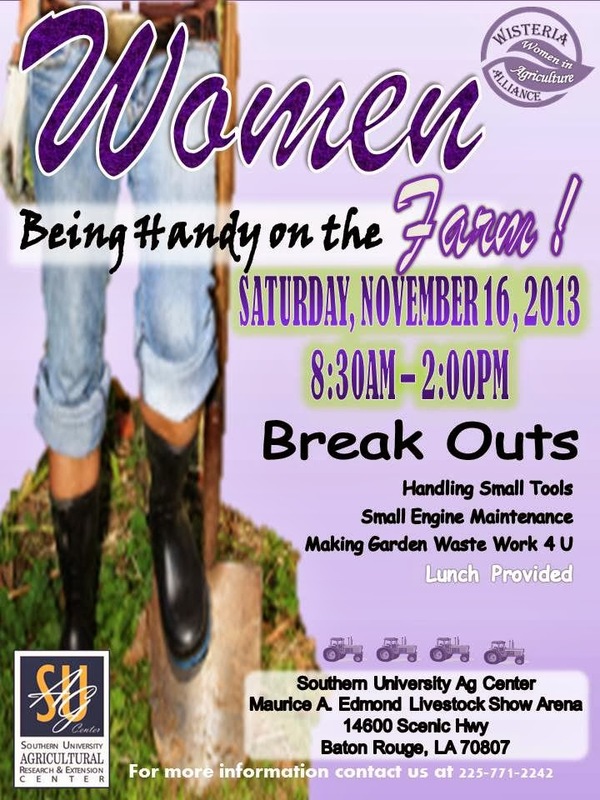 Stephanie M. Elwood, SU Ag Center Extension Associate for Community Gardens will organize the event. For further details or questions, contact Mrs. Angela Jackson, Ms. Stephanie Elwood or Mrs. Mila Berhane at 225-771-2242.